THE NATURAL HAVEN: What is the role of the father in caring for natural hair? What is the role of the father in caring for natural hair? I think when you have no help it can be hard but I do think that people have to do what they are comfortable with. My father never took care of my hair at all but I love my natural hair. Similar to your husband, he did do his role in telling us we were beautiful just as we were and I see how important that was now. My husband really does not care for hair care either. He will help me with creating parts at the back of my head because it is hard to see but that is pretty much it. He also once helped me curl a bride's hair/weave (her hairdresser failed to turn up, so guests to the rescue! ), and he was good at it but I know that it was not his favourite thing to do. I think as your girls grow the take home message should be that they should care for their own hair. Pass your skills to them so they can be self sufficient as they get to 9-10 years old. He sounds like a pretty nice husband to me. What do you think? What is the role of the father as far as natural hair is concerned? That is like expecting my husband to help me do my make-up! I am not saying they cannot but why expect them to do more? We should let fathers be just be that why try dilute their role and make them like Moms? It's not that serious.I don't think your girls feel that way at all, especially since you take your time to do their hair. LaNeshe - aversion is the word I was looking for. Anon - I generally agree with you but I do think there are some men who will be able to do hair and this is perfectly fine, we just shouldn't force them all to do it. On the subject of familial help, I would not trust any of my sisters to do my hair.....I think this is the thing with natural hair, often when you embrace it, the rest of your relatives are not following along and may not know what should be done. When my husband was little, his mother made him and his others sibs take down her braids all the time. Since then, he hates anything hair care! He shaves his own hair very low every week and won't even grown it out despite my pleading. This is one of the most interesting questions I have seen in a long time! I think what Carol is asking also speaks to the evolving roles of men and women in society today. With more to do sometimes life presents situations that call for us to step into a different set of shoes. Obviously most men have an aversion to hair care. But I think Carol sees this task as one of the things you do as a parent. @Anonymous 15:43 who commented that this is "Diluting their roles and making them like Moms", I think parents do what is needed to keep their kids comfortable. I don't expect that Dads will start doing braidouts etc, but if a hair band falls off why not just snap it back in place? I also think it's very important for a Dad to at least understand the concept of what it takes for their kids hair to get "done". They may have to pay for it in future or even take their daughters to the salon if Mum is not around. For those Fathers that are willing to do more e.g. I read about the Atlanta professor who twists his (adopted) Ethiopian daughter's hair, I applaud them. I also think that it would be great to hear about how Single fathers deal with hair care for their kids for example. On the subject of familial or other help: Not everyone is that lucky. Some people live far away from their family or they are simply too busy to help or they may not even be willing. 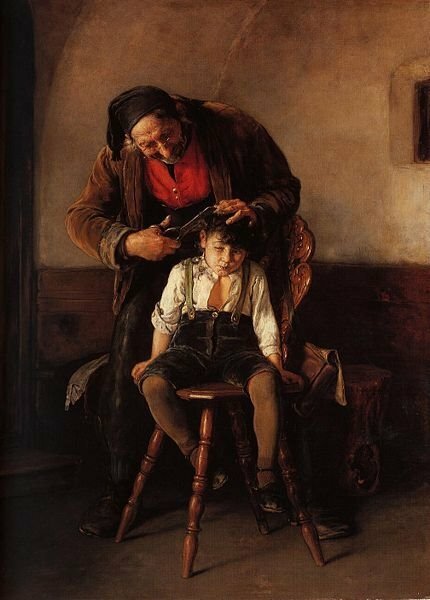 Considering how many fathers take an interest in maintaining their sons' hair, I don't think it's too much to ask them to at least be willing to fix a snapped hair band for their daughters. That isn't making them "like Moms", it's adding another tool to the toolbox. I travel often for my job and if my SO couldn't cover my responsibilities for a few days, that would weaken us as a family. My husband takes great interest in my sons hair and cannot wait to take him to the barbers(he is 5 months old lol).As for my daughters he cares about how my daughters hair looking good and if a hair band would fall off he would put it back on however i don't think he would sit for an 1hr+ doing box braids as i do each week and i don't expect that! JC - here's a tip for doing straight parts at the back of your head. Place your index finger at the back of your head, where the part ends and that would give you an idea of where to place the comb to continue the part. Its a bit hard to explain, but now my part are almost always straight. Also, to me hair care is generally woman's work, but every household divides labour in a different way - whatever works! My 3 girls are (mostly) grown now, but when they were little my husband was the one who detangled their hair. He is so much better at it than I am. He got some nice father-daughter conversations in during the detangling sessions. He came to our teenager's rescue last year when a comb broke off in her hair. I do the cooking in the family, and he detangles -- we all have our strengths!